Upgrading to Windows 10 is a very easy and convenient process as Microsoft offers the latest operating system as a free upgrade to Windows 7, 8 and Windows 8.1 users. However, as the operating system is still in its infancy, there are a myriad of problems that need to be resolved. Microsoft will certainly push updates to the new OS, reportedly as early as this week. If you have tried the latest offering and aren’t willing to wait for new updates to see if the problems that you are encountering are being resolved or not, downgrading might be your best option right now. 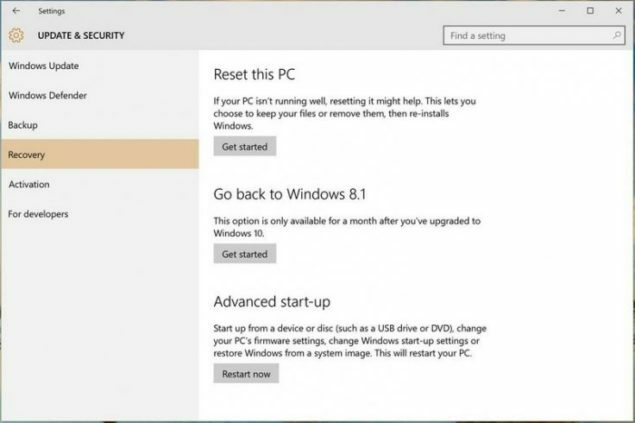 We have already shared with you how to fix Windows 10 installation errors and no sound problems that appear after upgrading to the operating system. Still not feeling up to the task of keeping up with this latest Windows? Follow this guide for a few and very easy steps to downgrade Windows 10 to Windows 7, 8, or Windows 8.1. Hurry up as this won’t work after 30 days of your making the upgrade to the latest Windows 10. Microsoft is offering users 30 days to easily restore their computers back to the version they were running before. Here are the few steps that you need to follow to restore Windows 10 to Windows 7, 8, or 8.1 depending on which operating system you were running. Important: You need to keep your computer (laptop / notebook) plugged into a power source to be able to downgrade Windows 10. This feature isn’t available to users who chose to clean their computers including Previous Windows Installations using the Disk Cleanup utility. Launch Settings (Windows key + I). Navigate to Update & security > Recovery. Under Recovery, you will find a Go back to Windows x feature – x is the version of Windows you were running before Windows 10. Click on Get started to initiate the restoring process. 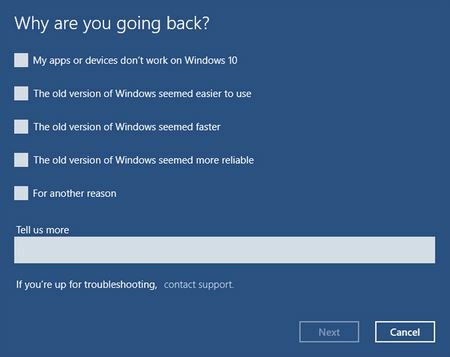 Next, Microsoft will ask you to provide reasons of why you are rolling back to earlier OS version. Follow the onscreen instructions and you will be good to go. Don’t forget to let us know why you decided to go back to the comforts of earlier Windows.